As a Product Manager, I frequently struggle with how many details I need to supply in an Epic. Say too much, the team doesn't read it. Too little, weird things happen. Years ago I wrote a requirement that spoke of an unique sequence number. The product delivered to me had randomly selected numbers that nonetheless were unique. I couldn't believe it .. randomly choosing the numbers, then testing uniqueness, was harder than just allocating the number in sequence. Which was, in fact what I had asked for. Today, another wonderful example, this time from my local bakery. Box up some cookies so we can sell by the package. Seems simple. What bake shop owner in their right mind would imagine some industrious packer breaking cookies to make the boxes as full as possible? 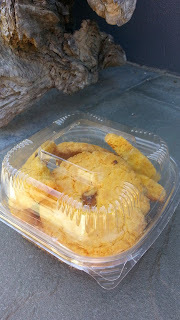 Such as this box, straight from the market, over half the cookies are, well, halves. Who would ever think to write in the epic, "Box up some whole cookies, take broken ones home for your kids." Or, "Don't break my pieces of art to make them fit!" It would be like writing in the manual for the pizza delivery driver, "Don't hit any fire hydrants with our delivery car!" Though come to think of it, when I was in high school another student did in fact wreck a pizza delivery car by driving it into a fire hydrant at full speed. Hmmm.